Submitted by Jeff Lutes, SOYA, ERYT500. 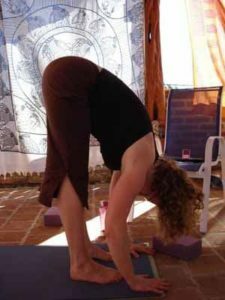 Photo of Carla Wainwright in Uttanasana. This is one of my favourite poses. It is simple yet provides for an amazing opportunity for self exploration. Uttanasana is a great pose to explore the polarity between active and passive energy. It has many modifications that are important to know and understand so everyone can do it. This pose is both a forward bend and an inversion. It is quite often my second pose in my standing poses. Stand in Tadasana. Feet are parallel to the long edges of the mat, hip distance apart, weight evenly distributed from the heel to ball of the foot. Wiggle the toes. Engage quadriceps. On the wave of the breath extend the crown of the head to the sky, and soften the shoulder blades. Place thumbs in the groin crease. Inhale, then exhale and bend where your thumbs are. Keep your feet grounded and legs active; extend forward, not down, yet. Place your hands either above or below your knees and stay here. This is Ardha Uttanasana, half forward fold. Lengthen the spine from the tip of the tailbone to the crown of the head. Bend your knees if you experience discomfort in the low back, hamstrings or back of the knees. As you inhale engage core strength, energize the quadriceps and lengthen. As you exhale tilt the pelvis forward and release deeply into the pose. Find a comfortable and spacious place to pause. Feel the crown of the head release to the force of gravity. When it strikes you find greater depth. Explore within the pose. You will be surprised what you find. Alternate between active energy-creating space, and passive energy-floating within the space you create. Breathe. Deep inhalations. Smooth exhalations. To come back to Tadasana soften the knees as much as required to slide the hands up the legs above the knees. With the palms securely placed above the knees straighten the arms and spine. With a neutral spine energize into the feet and come to a standing position. Caution: Lower Back, Hyperextension of knees, blood pressure. Modifications: Bend knees for low back and knees. Keep upper body level to ensure that the heart does not go below the head for blood pressure issues. This pose can also be done with a chair, sitting and folding forward over the thighs. Benefits: Lengthens and creates room in spine. Massages abdomen. Stretches hamstrings. Allows for introspection. Created by Sarah Britton (her blog is My New Roots). Submitted by Mugs McConnell. When I was visiting SOYA Teacher Heather Thomas in Ft McMurray this fall, she shared this amazing bread with me. In fact, she made me make it so I would really know how to do it. This bread is incredibly delicious, heavy like those wonderful European loaves, and totally gluten free! A silicone loaf pan makes it really easy to take out of the pan partway through the baking. If you don’t have one, then line the pan with wax paper or a silicone dehydrator sheet. To continue baking it on the rack I put it on a cooling rack in the oven for ease of taking it out. The “dough” MUST sit at least 2 hours before baking, or longer. And you MUST let it cool before slicing it. Once it is sliced I freeze some of it and just eat one piece at a time (it is very filling). THIS recipe makes one small loaf, but I actually double the recipe – the bread doesn’t rise in the pan so you can fill it right up to make a nice big loaf. In a bowl combine all dry ingredients. Whisk maple syrup, oil and water together in a separate bowl. Add mixture to the dry ingredients and combine until everything is completely soaked and dough becomes very thick, adding 1-2 teaspoons water if dough is too thick to stir. Press into the loaf pan so all the corners are filled, smooth top and let sit at room temperature for at least 2 hours or overnight. Bake bread for 20-30 minutes, then remove bread from loaf pan, place it upside down, directly on a rack (or a cooling rack), and bake for another 30-40 minutes (it should sound hollow when tapped). Let cool completely before slicing (even leave overnight, then it is easier to slice). Store in an airtight container for up to 5 days or slice and freeze.